Half-time adjustments from Martinez allow Everton to get a point against newly promoted Watford, after difficulties in creation during the first half. Basic formations during the first half. Everton began the match with their attack oriented towards targeting the right of the field in the final 3rd. 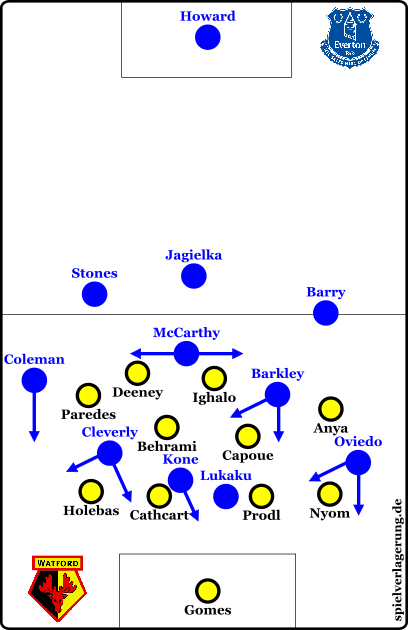 Their build up was stable with both centre backs and one of the central midfielders (Barry and McCarthy) situationally dropping either side of the centre backs to create a back 3 – with the fullbacks moving up to the midfield line. 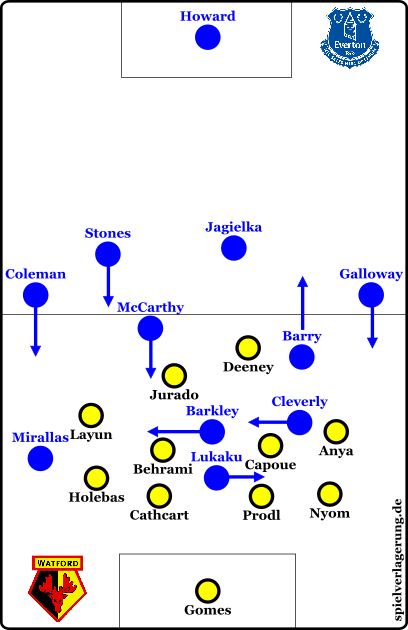 Coleman was very influential on the right, with Barkley moving across to the right halfspace in the final 3rd in order to try to connect with Coleman and Mirallas. However, they found problems when trying to create dynamic situations – due to the numerical advantage of Watford, making combinations difficult and man-marking local passing options. Watford were passive and let Everton have the ball, without pressure, in the Everton half – with pressure being applied on the halfway line. Their key defensive strategies were: to play with a deep defensive line, keep the back 4 closely connected and to defend small spaces, keep high numerical superiority in their own box, keep high numbers behind the ball, and to use wide pressing traps. Against the ball they would use variants of 4411, 4420 and 631. Their pressing traps would use the front two in central positions to try to block Everton from playing through the middle and encourage them to move the ball to the flanks. where one of the front two (usually Jurado) will allow the pass from the centre back to the fullback (high and wide in the Watford half) and will then move to block off the return passing lane. This is to force the Everton player to have the ball against the touchline (limited options) and have to find an option against the numerical superiority of the Watford block. The ball-near winger will apply pressure on the ball, the two central midfielders move horizontally towards the ball (and will look to man-mark), the ball-near fullback will remain in the halfspace (closely connected with the ball-near centre back), and the ball-far winger is man-orientated towards the opposition fullback. When they are defending in their own 3rd in these situations, their formation can become a 631 – keeping high numerical superiority and closely connected defenders in the box. Offensively they would mostly attack through counter attacks – with hardly any organised offensive play. Upon winning the ball their attack was focused around creating crossing situations, where the ball-far winger would join the box and both their fullbacks central midfielders would act in supporting roles behind the ball. If the ball was lost, they would drop – with the occasional individual player trying to counter press (not effectively). Towards the end of the the first-half, the switch of positions between Mirallas and Cleverely allowed Everton to use Mirallas to dribble diagonally into the left halfspace from the flank, after overloading the left and then using the opened space in the middle. This was more effective than whenCleverely was on the left and Mirallas on the right, as the player roles were different. On the right, Mirallas would be used to try and create combinations. On the left,Cleverely would be used to draw out Nyom and look to rotate positions with Barry and Galloway – trying to open the halfspace for Barkley to exploit with depth runs. This was easily controlled, as the Watford defenders can remain in their zones and simply switchover who each of them is marking. In short, and similar to a well known quote from Pep Guardiola, Everton were simply moving themselves, not the opposition. With the lack of central combination options, they didn’t have a way to get inside the block of Watford, nor did they manage to get a player on the ball, facing play, between the Watford midfield and defensive lines. With Mirallas now on the left and dribbling inside, opportunities to get inside the block of Watford were created. This caused problems for Watford and their space marking, due to the changeovers in the man-marking in each zone. Mirallas dribbling diagonally inside to exploit the opened space and play a through-ball for Cleverely. Basic formations after changes in the second half. In the second half, Everton changed their strategy to play more long and direct balls to Lukaku and look to play on the second ball. This was another method they used to create more central attacks, due to the earlier long ball to Lukaku from the centre backs going over the Watford midfield and pushing the defensive line back – creating space between the two lines. The wide players would also come inside and position themselves between the lines in order to either run behind for a flick on or to compete for the second ball from Lukaku. Due to the players now being closer together and able to find each other, the dynamic of their attacks improved. With the Watford back 4 narrowing to try to control the direct balls to Lukaku, the flanks were left open for Coleman, especially, to receive the ball and either cross first-time from a deep position, or progress forward with the ball and cross from the edge of the box. The introduction of Kone for Galloway (Barry to left back, Barkley drops deeper and Kone as a striker) allowed them to apply more pressure on the Watford centre backs and be more dangerous with their central attacks. He added some valuable back-to-goal associative play, to allow him to receive the ball and find teammates with layoffs – which Lukaku struggled with earlier in the match. He also made some good combinations with Lukaku, playing on the second ball. Both goals were created from these situations, where they had struggled in the first half – Barkley being used while facing play with the ball and to overload wide areas, whereas Kone would remain central. The changed role of Barkley moving forward to arrive from deeper positions also caused more problems. In the first half Everton weren’t dynamic, nor could they create good chances. A good change of strategy from Martinez at half-time allowed Lukaku to become more influential in the game, as well as the introduction of Kone bringing more passing options centrally. A good away point for Watford on their return to the Premier League, and it will be interesting to see how they play in their next match. Great piece, ML! Tactically the best game of weekend! Kone was amazing; assisted 1 and scored one!